Crows InterchangeJosh Jenkins and is possibly out for the game. 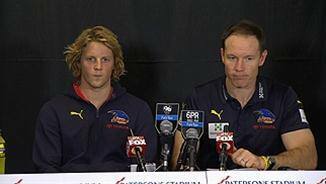 Crows InterchangeBernie Vince off due to the blood rule. GOAL DOCKERSWalters flies for the ball, taps it down to Fyfe who streams by and snaps truly, suddenly the Dockers are back in this one. GOAL DOCKERSWalters leaps into the air and protecting the ball with his half turned body takes a mark 30 out...he goes back and guides home the goal. BEHIND CROWSMcKernan has a set shot 30 out on the slightest of angles...he over compensates for the breeze and leaves it hanging out wide.. 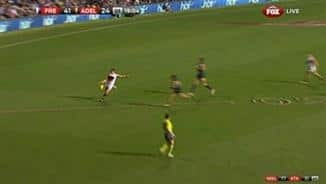 BEHIND CROWSLynch, running away from goal, gathers the ball in heavy traffic he half turns his body and slings the ball onto his boot...it goes behind. BEHIND CROWSVince marks on the wing but sloppy football sees a Docker run across the mark and gift him a fifty metre penalty...from the arc Vince's kick is dragged wide for a behind. GOAL CROWSLynch marks 20 out right in front and has no trouble guiding the kick home. With the wind advantage the Crows need to make every post a winner. BEHIND DOCKERSde Boer's kick is into the teeth of the gale and holds up on the line...the Crows' defence thumps it through conceding the behind. The Dockers finally twig and keep the ball low and are rewarded as de Boer marks just inside the arc. 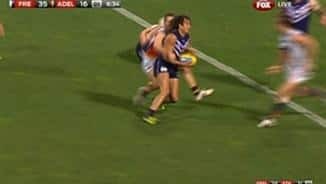 Fremantle insist on kicking the ball high into the forward line, it is holding up in the breeze and allowing the Crows to get numbers to the contest. BEHIND CROWSMackay is on the outside of the pack, as he flies by the ball is shot out in his direction, he looks to lob the ball into the breeze and have it sail through...it doesn't. GOAL CROWSThompson marks outside the arc but with the wind at his back he launches the ball off two steps and pumps his fists in celebration as it sails through. The ball is 'ping ponging' between the 50 metre arcs, however the Crows are kicking with a healthy tail wind. The Dockers force the turnover from the Crows and now it is their turn to try and open the scoring. There will be no first bounce as both sides explode into a melee before the bounce...Adelaide will be awarded the free kick and will go straight into attack. The ground will be heavy after a wet day and the Subs are Sutcliffe for the home team and Tambling for the visitors. Adelaide will be bubbling with confidence after running over the top of the Cats last week and having beaten the Dockers at Patersons Stadium last season will feel they are in with a great chance. Welcome to the west and the clash between the Dockers and the Crows, on their last outing Fremantle succumbed to the Tigers in Melbourne and will be looking for the win. Welcome to Patersons Stadium for the Fremantle v Adelaide Crows Round 18 clash. 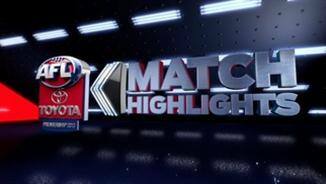 FREMANTLE reaffirmed its top-four credentials and ended the unlikely finals hopes of a gallant but inaccurate Adelaide with a 22-point win at a windy and wet Patersons Stadium. The horrible weather in Perth meant only 28,765 fans braved the conditions to see the Dockers notch their 12th win of the season, 11.9 (75) to 7.11 (53). 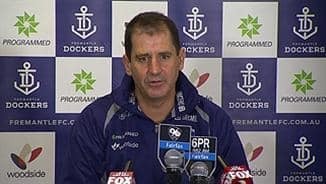 Remarkably, the Dockers had just 33 inside 50s - the equal-lowest of any winning team since the statistic has been measured. The Crows had 45 entries, won the total possession, contested possession, clearance and tackle counts for the match but lost in the only column that matters - the scoreboard. "We won every major indicator but the most important one, which is winning the game of footy," Crows coach Brenton Sanderson said. "They won the game, but you shouldn’t win a game when you have 33 inside 50s. 3.8 from set shots is something we need to get better at. "We need to be more poised and composed when it matters." Nathan Fyfe was the chief architect, kicking a career-best four goals in an outstanding display of class and skill that stood out above all others. 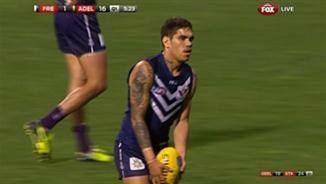 "We knew he's a goal kicker," Fremantle coach Ross Lyon said. "When you talk about run and quality I thought he was very smart against the opposition tonight and he hurt them. "If you don't respect him pushing forward he's going to hurt you." The match started with a melee and a free kick to the Crows instead of the customary bounce. 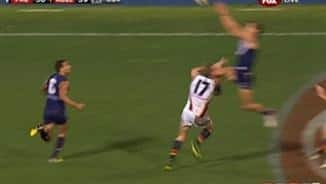 Nathan van Berlo was confronted by Michael Walters and Danyle Pearce in the centre square as the players walked to their positions and the push and shove sparked an all-in wrestle involving a dozen players from both teams. The Crows jumped out to a 15-point lead as a result using the aid of a strong breeze and should have been further in front, having dominated the play, but they missed several crucial set shots. The Dockers made the Crows pay for those missed opportunities, kicking the next five goals of the match on the back of the class of Fyfe and the supreme skill and smarts of Walters. Fremantle led by four points at quarter-time and extended that to 23 at half-time as the Crows managed just two behinds in the second term despite more inside 50s. Rory Sloane got the Crows back into the contest with an enormous third quarter. Sloane had 10 disposals, six marks, and three tackles for the term and had a hand in the Crows' three goals, which cut the margin to just five points. But Fyfe stood tall again, kicking two goals for the quarter to take his tally to four and restore the lead to 23 at the final change. Adelaide threatened a comeback in the final term but more missed opportunities from convertible set-shots saw the Crows fall short. Adelaide's night was soured further with Josh Jenkins carried off on a stretcher with a nasty injury to his right ankle. After launching for a mark, Jenkins landed awkwardly with the full weight of his 104kg frame buckling his ankle underneath him. Fremantle: Cameron Sutcliffe replaced Matt Taberner in the third quarter.